it took about a billion years, but we finally managed to get the go/no-go “autofocus” release shipped off to the duplicators (and flying over the internet in the general direction of itunes, which feels a bit weird). we got a few clips done as well, thanks to stu willis for making the “catching up with you” clip possible. anyway, we did it all DIY, and it worked out okay, so we’re gonna have a shot at a follow up EP the same way. but hopefully a bit quicker this time. i’ve had the urge to write about the recording process for a while, and this seems like a good place to start. also, i’m waiting for a plumber to show up and can’t really do anything else in the meantime. it took a few years, but i’ve finally got myself a mobile recording rig that works pretty good and fits in the back of a daihatsu charade. the main problem is getting enough equipment to get a nice drum recording – once you get past two channels, everything gets a bit spendier and more complicated. and you end up with mic cables everywhere, and i’m really bad at winding them up neatly. anyway. last sunday, we dragged our gear down to zen rehearsals to track drums and bass. we record there mainly because they run free bbqs on weekends, and they have a well maintained cappuccino machine. 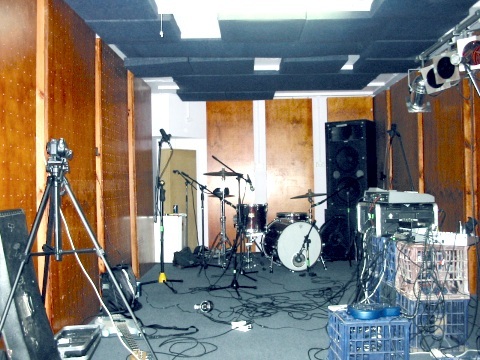 also, because some of their rooms are really well sound-proofed and have excellent room treatment, which is important – if the room sounds boxy (or if sydney’s loudest metal band are bleeding through the air conditioning system), the recording will sound bad. cue: five hours of recording, five tracks of drums and bass done, despite 50% of the personnel suffering from crippling hangovers. check out all the mess! once i get everything home, i usually mix up a nice sturdy martini and transfer the tracks over from the portable recorder to the PC. the ancient vs1680 recorder i use is cheap, solid and sounds good, but getting the raw audio out of it onto the computer requires screwdrivers and lots of time and weird software and usually i have to shout at it a bit as well. but eventually i end up with the session loaded up in reaper, ready for edits. once i’ve mapped it out, i hack the best bits together, get a rough mix up, and start thinking about another martini. and overdubs. in other news… where the hell is that plumber? next up: percussion. in a week or two. with any luck.